On June 27, Fiji’s national airline Air Pacific underwent a changeover in flight status by returning to its roots with its founding name, Fiji Airways. 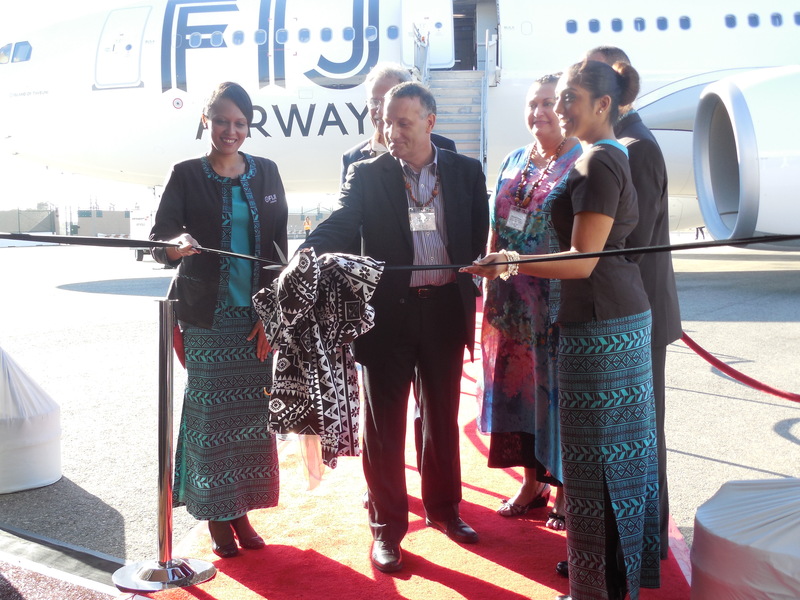 The launch date also rolled in a number of significant changes for the carrier, including a new line of three A330-200 airbuses and a rebranding that incorporates the Fijian tradition of Masi motifs. 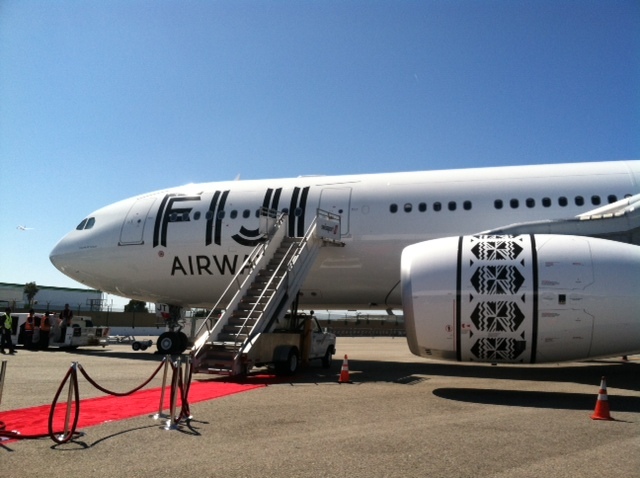 To reveal these changes to American flyers, Fiji Airways hosted a consumer launch party at the Flight Path Museum in Los Angeles on July 8. A private walk-through of an A330 led by the airline’s CEO Aubrey Swift provided a sneak peek at business and economy class with enhancements ranging from seat design to inflight entertainment. Business class guests will sleep comfortably as the section’s 24 seats are now equipped with an eight degree in-flight sleep bed and 76 inches of bed length at 60 inches of pitch. Fliers in this section will also find Panasonic’s 15.4-inch LCD displays, a handset that includes a credit card reader and keyboard, a noise cancelling audio jack and a USB interface. They will also receive special amenity kits for overnight flights and noise cancelling IFE headsets. With meals, fine dining will include world-class menus with more choices and a selection of fine wines. 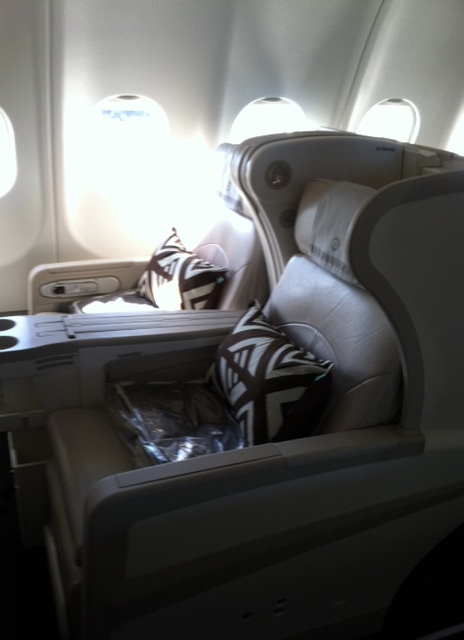 Another new feature for business class is a sleeper and breakfast service called Yadra Vinaka. Meaning “Good Morning” in the Fijian language, the service lets passengers specify when they want their morning meal served. With seating, the 254-seat economy class on the A330 hasn’t been forget about. Slight adjustments relating to the armrest and seat angle have been made to increase personal space. Passengers can also stay entertained with a state of the art system from Panasonic’s eX2 that features on-demand television programs, movies, radio, video games, and other applications. The system also contains a USB port for charging devices. An outlet plug is located on the lower part of the seat. And for young passengers, a Fiji Airways Kids Club provides complimentary entertainment for children with movies, games and e-books. Right now for the U.S. market, the airline offers flights from Los Angeles International Airport (LAX) to Fiji six days a week. In December, there will be seven flights per week (adding on Fridays) and, during Fiji’s peak travel season, eight flights a week out of LAX. In addition to the new A330s, the airline will be upgrading its existing Boeing 737s through the end of this year. Culturally speaking, the airline has rebranded its trademark by incorporating Masi motifs. Created by recognized Fijian Masi artist Makereta Matermosi, this stone-toned symbol will grace the aircraft’s fuselage areas. As for inside in the aircraft, blankets and pillows also have Masi patterns with an earthy-shade for business class and a salmon hue in economy. Flight attendants will also be sporting color as well. 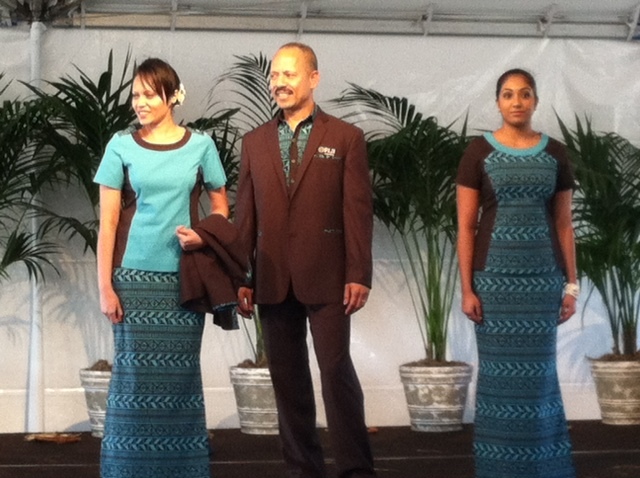 Their new uniforms contain vibrant hues and rich tones and patterns reflective of Fijian culture. Accompanying our crew on board the A330, Elizabeth Powell, Fiji’s permanent secretary for public enterprises and tourism and director of the board for Fiji Airways, shared new marketing strategies aiming to promote Fiji to Americans as a potential vacation destination. In visiting Fiji, Powell cited that Americans are more likely to seek to connect more with the country in ways that differ from their Aussie and New Zealand counterparts. The latter appear to opt for short stays or remain at one hotel or on one island. With American visitors, their vacation interests involve pursuing adventure activities and interacting with local residents to learn more about culture. For those who love spending time in the ocean, water activity options in Fiji can encompass everything from surfing to water rafting to diving. For newlyweds, Fiji can also be considered as a honeymoon location or even for holding a destination wedding (having a Fijian ceremony can happen too). “If you’re the type of person looking for something that’s unusual [and] genuine, that allows you to be part of that experience; that is why [you] should think about Fiji,” Powell explained. Fiji Airways CEO Aubrey Swift (center) is joined by Elizabeth Powell, permanent secretary for public enterprises and tourism and director of the board for Fiji Airways, (back) and the airline’s flight attendants in a ribbon cutting ceremony. And that thinking appears to be on the rise. Since 2009, U.S. visitors to Fiji has increased by 3 to 4 percent, and 2012 welcomed in around 56,400 visitors. For this year, Powell cited that estimates will factor in double digit growth. Oprah Winfrey’s visit to Fiji last December has also been a major tourism boost. A recent announcement about the historical port town of Levuka becoming a UNESCO World Heritage Site has been good news for Fiji as well. According to Powell, Fijians are genuinely warm welcoming to visitors, noted for their sense of hospitality. “It’s in our DNA,” she added. Fiji Airlines’ rebranding compliments the tourism board’s new direction. Each of its three A330s will be named after Fijian islands. Two planes have taken their positions this past March and May. The third aircraft is scheduled to make its debut in November. All three of them are powered by twin Rolls-Royce’s Trent 700 engines that are made to be fuel efficient and produce less C02 emissions. Similar to Tourism Fiji, Fiji Airways’ turnaround plan took off in 2010, and further product and service enhancements will continue through the rest of this year. To continue on its celebrated launch, the airline has launched a fare sale. Now through August 31, 2013, book round trip Los Angeles to Fiji direct starting at $999. Conditions may vary. Visit www.fijiairways.com. For more information about Tourism Fiji, visit www.fiji.travel. This entry was posted in Air Travel, Fiji, Fiji Airways, South Pacific and tagged A330 airbus, Fiji Airlines, flights from LAX to Fiji, flights to Fiji, things to do in Fiji, Tourism Fiji on July 18, 2013 by She Is Going Places.